Euro-zone flash PMI came worse than expected and put more pressure on EUR. ECB Interest Rate Decision and the US Durable Goods Orders data will bring some volatility to the market. 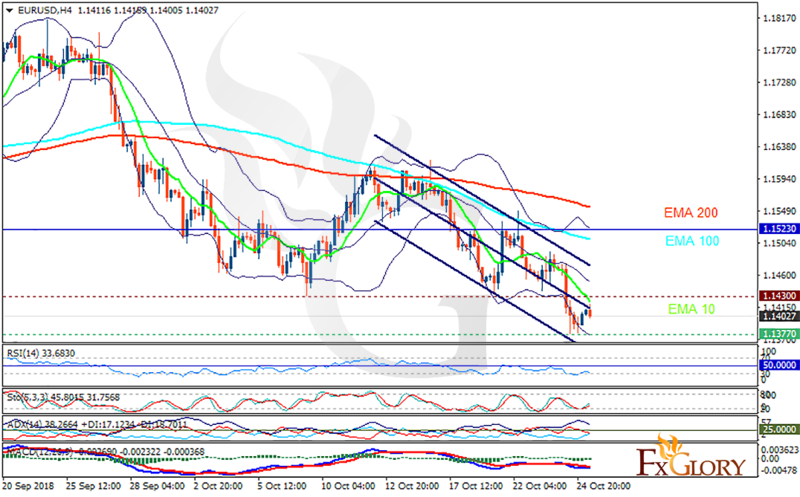 The support rests at 1.13770 with resistance at 1.14300 which both lines are below the weekly pivot point at 1.15230. The EMA of 10 is moving with bearish bias in the descendant channel and it is below the EMA of 200 and the EMA of 100. The RSI is moving in oversold area, the Stochastic is showing upward momentum and the MACD line is below the signal line in the negative territory. The ADX is showing sell signal. The price may fall as low as 1.135 but the correction pattern will start and take the rate towards the Upper Bollinger band.